Over the years I have owned, sold and traded in a number of jazz guitars. Some were cheap, others not so cheap. I always bought them used. Never bought a new one. Guitars came and went. I no longer own any of the guitars listed below but it's kind of fun to look back on what I used to own for a while ... The order in which I present these guitars is not strictly chronological. The playing in the vids is pretty old so not always representative of where I am now (hopefully). All of these models (except the Gibson ES 335 of course) are out of production nowadays. A guitar blast from the past! I remember buying my first used archtop in the early 1990s. I don't have a picture of it anymore but, after some research, I think it must have been an Aria Pro II FA 70. I found this pic on the internet and it is the exact guitar I once owned, even in the same finish. It had an ugly pointy headstock but was a nice enough guitar. I played it for a couple of years and took my first jazz guitar lessons on it. I think I got this Cort ES 335 in the late 90s. 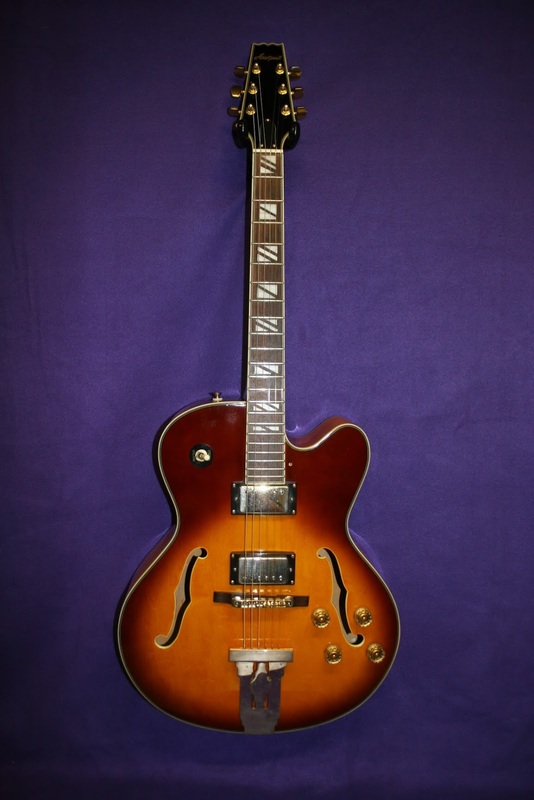 Anyway, it was my first thinline archtop. Not sure when I sold it again ... It was ok I guess but I don't think it made that strong an impression on me. The early 80s Yamaha AE 2000 that I purchased in the late 90s was my first high end guitar with a carved top. 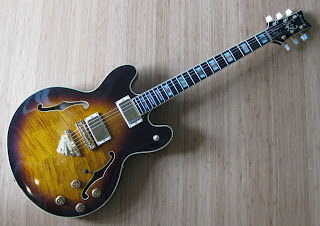 It was Yamaha's top of the line jazz archtop from 1978 onwards until well in the 1990s and pretty expensive. Excellent guitar, modelled after the Gibson L5. I liked it so much that I bought another one a few years later. In the first pic you can see the first one. I had to replace the pickguard on that one. The second pic shows the AE 2000 that I bought a few years later. Joe Beck, Martin Taylor and Bireli Lagrene all played the AE 2000 for a while. Later in the 1980s, Yamaha started producing this model as laminates under different model names. My AE 2000s were outstanding guitars, both of them, but in the end I preferred the classic sound of Gibson laminate guitars and I sold them or traded them in. And here's a sound sample of me playing it. At the time I must have been studying Joe Pass for there are quite a few Pass licks in it. The next pic is of a Samick L5 style (model HJ 650) that I bought just because it was inexpensive. A really nice El Cheapo jazzbox. I liked the tobacco brown finish a lot and the sound was more than decent. Great value for money. I remember trading an acoustic guitar for this 1970s Aria Pro II PE 180 guitar. It proved to be a very enjoyable instrument. It had a big fat chunky neck but a very decent sound. And it looked like a million bucks! I think Robert Conti endorsed one of these equipped with a Charlie Christian pup for a while somewhere in his career. Next guitar. I think I purchased this Gibson ES 335 somewhere in the mid 2000s. It was a 1987 model. Very comfortable to play and sounding good for bebop. It did not own it for a very long time but did use it for a few gigs and a number of videos. Later on I traded it in on a Gibson ES 350t that sounded a big "bigger" to my ears. But it was a nice guitar. In 1998 I purchased my first vintage Gibson archtop. It was a 1951 ES 125. I always enjoyed that one and I recorded many vids with it. I think it had the best sound of all the guitars that had owned until that time. Well, most of you guys will know this model anyway. I think this guitar paved the way to me finally settling down to the classic Gibson sounds of the ES 175, the ES 350 and the Tal Farlow in the mid 2000s. I probably would have kept it but at some time I simply did not want to own more than 3 guitars anymore. 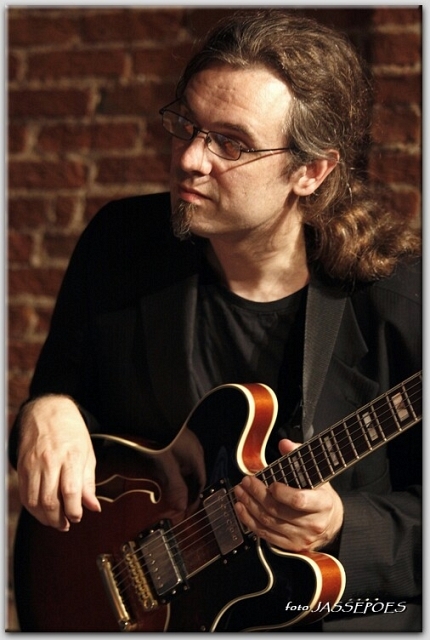 Since 1998 Danish born Jens Larsen has been active as a guitarist in the Netherlands. He studied at the Royal Conservatory in the Hague and graduated in 2004. He is active in several bands of which Traeben, an international jazz quartet, is probably best known. They released their second album “Push” on October 1 last year and their music has received some fine reviews. Time for an interview! I started playing guitar when I was twelve. I had classical guitar lessons and was a few years later getting pretty serious about that. I was not sure if I should try to apply for the conservatory or do university. I ended up choosing for university and studied mathematics and IT in Århus. No I did not start playing jazz until after I finished university.I sort of ended the study with a bachelor having the ambition to learn jazz. At the time I was mostly playing electric guitar and really learning a lot of Jimi Hendrix, Stevie Ray Vaughn and Pearl Jam. I then found out that I really liked Charlie Parker's stuff and also some of the Scofield Quartet with Joe Lovano, probably because it was very bluesy it made sense to me. You studied at the Royal Conservatory in The Hague. 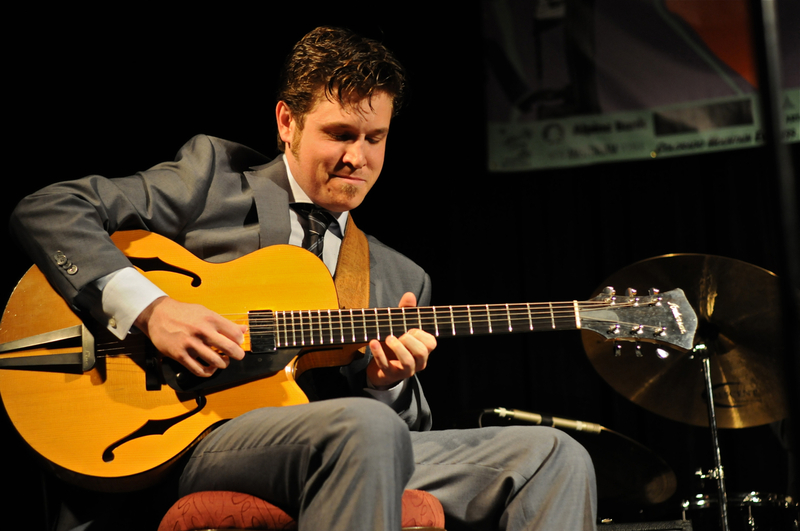 Do you recall a particular practice routine when you were a jazz guitar student in the Hague? I did not have any real routine, I did at times study technique or other things very structured, but I was also always just playing songs a lot, and playing with other students as much as possible. To me conservatory was a place to play, time to practice and teachers to learn from. I learned as much from playing with people as I did from practicing and having lessons. With whom did you study? What were your lessons like? What did they focus on? In the beginning Eef Albers and Peter Nieuwerf, later also Wim Bronnenberg. I think I probably had lessons in almost anything jazz related during my study, sometimes I'd choose a subject for some time, other times I would get assignments from the teacher. Another teacher that I learned a lot from is Bjarne Roupé who is a teacher at the Conservatory in Copenhagen. He taught me a lot of solid basics about playing changes and also helped open my ears to a lot of things. Which jazz guitarist(s) had the most influence on your playing in those days? Probably Kurt Rosenwinkel was the biggest influence on me, his approach to guitar and ability to sound like he is rooted in tradition and at the same time innovative was always very impressive to me. I also learned more than an album full of Wes solos, almost the whole of Smoknin at the Half Note and a few others. Just before I started conservatory I had worn out “Lorne Lofsky's It Could Happen To You” album. When and where did you start doing jazz gigs in the Netherlands? I started playing gigs in Holland when I was in my 1st year of school, mostly comping singers in Cafe's etc. Then I was part of the house band for a jam session for a few years in Musicon in the Hague. The bandleader was Rene Winter. I've learned really a lot from him and checked out a lot of stuff together with him. From my 4th year I had to make a living playing, since I'd already done another study. Later I also started to teach. Composing and improvising music was something I was doing right from when I started playing. I just did not really know I was doing. It was just having fun and exploring, and sometimes I'd end up with small compositions. Well I don't exclusively play and teach jazz, though it is probably what I do best. I play most gigs I get asked to, and often it is nice to learn other styles of music. I like the variation and different challenges. Being a guitarist I prefer playing to teaching, but at the same time I really like teaching, it is fun to pass on knowledge or figure out how to explain or demonstrate a skill to a student. It gives you a deeper understanding of the things you teach. How would you define your own style? Bebop, mainstream, contemporary? What bands are you in currently? I am in a lot of different bands, some are active now others are on hiatus. The band with the most work is Træben, where I also write a lot of the music. We're starting to get recognized a bit more, and things are happening, among other things we are playing in Denmark and have a tour in Canada. We've also been on TV in the Netherlands. Others include Wijnen, Winter & Larsen, Wild Bill, Yvonne Smeets Quartet, Jazz4kids, Jan Verwey Quartet etc. etc. Could you mention some highlights in your jazz career? The concert with Michael Brecker in the Hague in 2003 comes to mind and also playing at North Sea was fun to try. For Træben to play at Vrijge Geluiden was a big event I guess, and also that we are beginning to reach outside of the Netherlands feels very good. I am really proud of the latest Træben album “Push” since it is a lot of my own music. It is also really nice that it has been received so incredibly well by press and audience alike. That said I never really listen to my self, except if I want to figuring something out that I want to develop or change in my playing. Your Top 5 jazz albums are … ? I am using an Ibanez guitar, it's an Artist 2630 model. I am using a fractal AxeFx Ultra through a QSC K10 for amplification and effects. I really like the flexibility of that setup, both the guitar and the AxeFx are very flexible tools for a wide range of playing situations. I don't have a specific approach, I try to find a way that works for the student, taking into consideration the skill level and experience with other genres. I don't believe in complete methods fro teaching, but I do have a set of options for teaching a lot of specific skills. I check out the forum at jazzguitar.be quite often, for the rest I just look on youtube. The one with Pat Metheny warming up is always scary and inspiring at the same time because he makes scales and arpeggios sound like good music. Who are your favorite Dutch jazz guitar players? I was lucky enough to have some lessons with Maarten van der Grinten while I was doing my masters and he is maybe one of the best musicians I've ever played with. That was so much fun, and his ability to communicate while playing is fantastic. He also has a really wide set of approaches to comp and solo, to me he is a little overlooked here in the NL. Anton Goudsmit is also a favorite, for much the same reasons, I never played with him or had lessons from him, but I really like his playing. I am busy writing music for the next Træben album which we will record in the autumn and it will be released in 2014. We are of course busy with booking concerts for the next year or so. A tour in Denmark in 2014 is coming up, and Germany and Eastern Europe is also in our sights. The tour in Canada in July. You're welcome, I am always happy to talk about jazz, music and guitar! And I am also grateful that you are interested in my music and me. 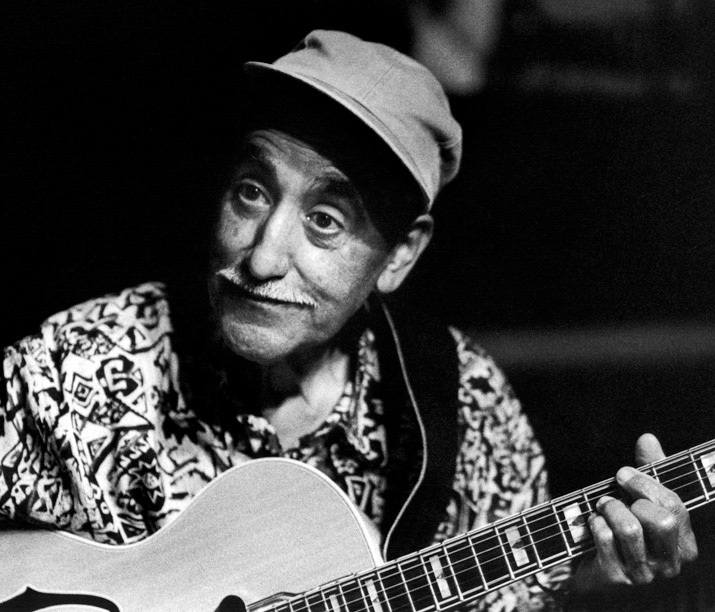 One of the unsung guitar heroes of jazz is Eddie Duran. He was born to parents of Mexican heritage in 1925. He started playing the guitar when he was 8. Although he did take a year of lessons, Eddie considers himself to be an “ear player.” He was a professional at the age of 15, and in the heyday of the San Francisco bebop scene, he played and recorded with Vince Guaraldi, Red Norvo, and Cal Tjader, as well as with Charlie Parker, Stan Getz, George Shearing, Earl “Fatha” Hines and Benny Goodman. For many years Eddie was little known outside the San Fransisco area. His output as a leader is limited but check out his work as a sideman for Vince Guaraldi, Earl Hines and Benny Goodman. And here's a live clip from 1980 which clearly demonstrates his virtuosity. That's Benny Goodman on stage, with whom he was touring in Japan at the time. Somehow I missed this guy until now. I was very pleasantly surprised when I viewed a vid of Graham Dechter posted on a jazz Blog. Definitely a guy after my heart. Very much in the bop tradition but still a fresh approach to the standards that he plays. A bit like Emily Remler did in the 80s and Mark Whitfield in the 1990s. Very nice arrangements, great rhythm sections (Jeff Hamilton and John Clayton), excellent guitar playing. What more do you want. Here's Graham Dechter!